One of the greatest home chemistry experiments is mixing cornstarch with enough water to make it the consistency of Elmer’s glue. This highly viscous liquid behaves in fascinating ways. For example, if you poke it really hard with your finger it will hurt. If you simply put your finger on it slowly, it will feel like glue. You can peel the liquid from the bowl and hold it in your hand and even break it into pieces. It will seem like a solid, but then as you let it rest, it will become a liquid in your hand. 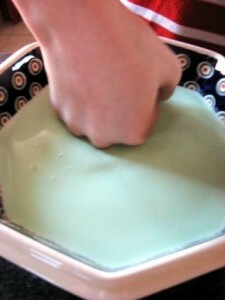 If you try to stir it quickly, it will push back, if you mix slowly though, it offers little resistance. Even as an adult, I find this fun to play with. The same properties can be observed in human affairs. Very often, we see a solution to a problem and so we push an individual or a group to change. We push hard, but the harder we push, the more they push back or they simply crumble, neither of which results in anything positive. Yet with gentleness many things become much more pliable. One lesson that my dad taught me when I was trying to fix things (or just get them to work) was “not to force it”. If a screw is resisting, it may be misaligned. Forcing it is likely to cause it to be stripped rather than to fix the problem. Or more likely, if the video game is not going in properly, don’t push harder. I think of this from time to time when I’m trying to fix something around the house — when the thing I am trying to adjust pushes back, I reconsider my approach. The same idea carries over into how we deal with others. I have a friend who works as a contractor for an engineering company. As a contractor, he’s gotten shot down for pointing out the things that blatantly need to change. As I watched him work, I could see that he had become an expert at the Socratic method — asking questions about the problem until the other person came to express the problem themselves, now with much greater receptivity to fixing it. At times this approach drives me crazy. I want things to be direct, straightforward, and onto the next thing. My approach often doesn’t work. What I need to remember is that like cornstarch and water, change can’t be forced, but it can be guided with gentle pressure. Current think sometimes notes that we need only two tools: duct tape to tighten things that are too loose and WD40 to loosen things that are too tight. All else, I suspect, are as you have suggested “relative,” which is life itself. Luckily, we have not been provided a world unduly transient in physical states–solid to liquid to gas–but rather a very dynamic and temperamental laboratory to discover ourselves, our loves, and our hates. Hold steadfast friends for the times they are a changin’. Were honesty, sincerity, love, and courage only of greater value, eh? Thank you for being alert, Matt!